Inaugurating the Vivekananda cultural and research centre here today, the President, Dr A.P.J. 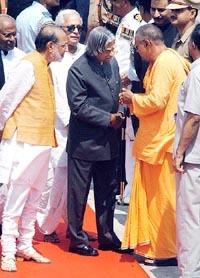 Kalam, called upon the people to follow Swamiji’s ideas and teachings that were much relevant today. These teachings should also be taught in educational institutions, he advocated. During his one-day visit to the state the President visited the Ramkrishina Mission and math at Belur in the morning and spent the time with students and teachers at Santiniketan before coming to Vivekananda’s ancestral house in central Kolkata to formally inaugurate the cultural complex and research centre. He returned to Delhi late in the evening. Shortly after landing at Kolkata airport around 11.30 a.m the President flew to Belurmath in an helicopter. He was received at the airport by Governor Viren J. Shah and Chief Minister Buddhadeb Bhattacharjee and other dignitaries. At Belurmath, Dr Kalam spent over half an hour meeting Swamis. He also visited the temple and went round the ashrama. He called on the Ramkrishna Mission and math’s President, Swami Ranganathanandaji. At Santiniketan, the President spent over two hours with students and teachers and exchanged views on the writings of Rabindranath Tagore. He also visited Tagore museum from where Tagore’s Nobel Prize Medal and other memorabilias were stolen about six months ago back. Dr Kalam held talks with the Vice-Chancellor, Dr Sujit Bose.